Majors Home Improvement installs patio enclosures from TEMO for homeowners in Pensacola, Florida, and all surrounding areas. TEMO is one of the leading manufacturers of outdoor living solutions, which means you can count on receiving an outstanding product that will stand the test of time. A patio enclosure is the perfect home upgrade, as it will increase your home’s overall living space and give you a room that allows for beautiful views of your backyard while protecting you from common outside nuisances, like bugs, UV rays, and inclement weather. Screen rooms – Our screen rooms feature lightweight vinyl sashes that block up to 99 percent of harmful UV rays, large window openings that offer full ventilation, and solid thermal roofs that deflect the sun’s heat. You’ll be able to choose from the functional studio style or the elegant cathedral style. Sunrooms – These patio enclosures, available in studio, cathedral, and California styles, feature expanded polystyrene roofs and vinyl insulated windows that provide incredible energy efficiency. And, they come equipped with exclusive TEMKOR interior/exterior surfacing that resists scratching, chalking, fading, denting, and other damage. Our experts will be happy to work with you to discuss your style options and help you choose the best patio enclosure for your home. What’s more, our patio enclosures are installed by factory-trained technicians who are friendly, experienced, and respectful. They adhere to strict customer service guidelines, such as taking off their shoes when they are in your home and keeping a clean worksite. 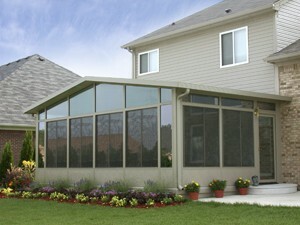 If you’d like to learn more about our patio enclosures, contact Majors Home Improvement today. We are proud to serve homeowners in Pensacola and all surrounding cities in FL.